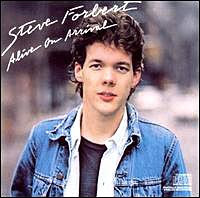 I'm not sure exactly how I came to learn of musician Steve Forbert, he released his debut Alive On Arrival 30 years ago this year, I was in my late teens and likely read a review in Rolling Stone (which, unfortunately, is a pale sickly shadow of what it was back then). There are several memorable songs on the album, songs which I hadn't heard for at least a decade, but even with the strong songwriting from the perspective of a young man from Mississippi making his way in the lonely New York jungle, it's Forbert's voice which always wins me over. It's a soft rasp, one which immediately sounds friendly, or familiar, but, oddly enough, unique. That one of a kind quality is borne in the phrasing he employs, not in an in-your-face style, he's much more subtle than that... it's the little things here and there that quietly snag like burrs in your socks. SO great to see this post! I love Steve and have since I first heard Alive On Arrival way back when. He puts on a great live show (I've seen him twice,) and he's very cordial. Like you, the voice always grabs me! You're welcome, Nat. Good to hear from you once again. one of Steve F.s great songs..
ULF: You're in luck, take a look at the Sixeyes Monday Mix: Sept. 22. Indeed I am lucky. Today. Thank you Alan. Tusen tack!